When I got back from class there was a checklist taped to all the doors along the hallway. It was a checklist for winter break, and what we had to do in our room before we left. I read the fourth line: "unplug everything." Which makes sense, because of standby power, and it's why my power strip has a switch on it, except, there's a tiny problem. And that is that our fridge and freezer are not empty. While my roommate's stuff is complete meals, I had seven sticks of butter, a package of cream cheese, melted chocolate, peanut butter, and a frozen overripe banana. In other words, the cast for a baking extravaganza. And less than two weeks to do it in. And I make things very slowly. So I decided last night was as good a time as any to start. I was going to go to my roommate's dance theater performance, but I'm going tonight instead, and it's not like I'm getting any studying for that Psych exam anyway... Might as well procrastinate in a useful manner. And use up three-quarters of a pound of butter while I'm at it. (I got some eggs with my meal points... they cost more than my dinner.) My parents sounded a bit disappointed when I called them in response to a text of "What's up?" and told them I was alone and washing dishes. But it was all worth it! These blondies are rich, delicious, and chewy. They have the approval of everyone who has tried them... though my roommate had to cut them herself, because I was too busy playing DDR. Now I just need to use up that remaining pound of butter and half pound of cream cheese. Note: the recipe called for 2 Tablespoons of vanilla extract. I can't read, and with the chocolate chips, it's okay. 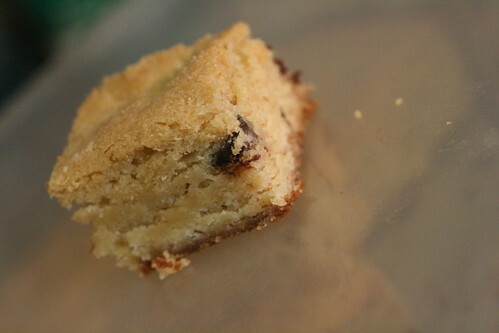 If you choose to omit the chocolate chips, it would make for a very rich tasty blondie. Position rack in lower third of oven. Preheat oven to 350ºF. Butter a 9X13 inch baking pan. In a medium bowl, wisk together the flour, baking powder, and salt. In a large bowl, cream the butter, granulated sugar, and brown sugar with an electric mixer (stand mixer works better here, my hand mixer started to groan) at medium speed; continue beating until pale brown and thick, about 7 minutes, Add eggs one at a time, mixing well before each addition. Scrape down sides of bowls as necessary. Beat in fourth egg for about a minute; beat in vanilla. Bake for 45 minutes, or until top is light brown and a toothpick comes out with a few moist crumbs attached. Set the pan on a rack to cool for at least 30 minutes, otherwise you'll end up with a mess on your hands. Cut brownies into desired number of pieces while still in the pan. Carefully remove. Serve, or let cool completely before covering. Eat within 3 days, or freeze them for a couple months.